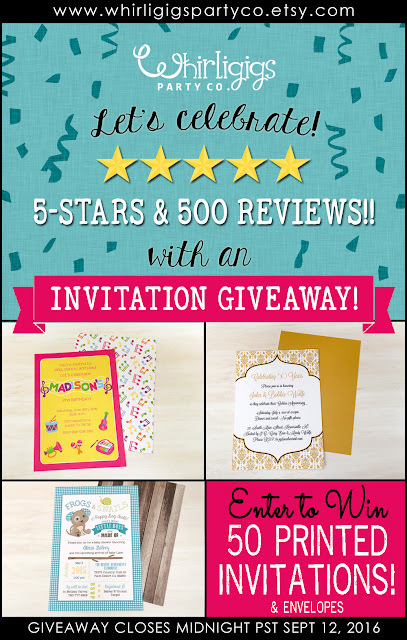 Whirligigs Party Co: GIVEAWAY : Free Printed Invitations celebrating 500 Positive Etsy Reviews! GIVEAWAY : Free Printed Invitations celebrating 500 Positive Etsy Reviews! Thank You Etsy customers for 500 Positive Etsy Reviews! To celebrate, I’m doing an invitation giveaway!!! As an online Etsy shop owner, I work alone from home. I hardly ever get to see my customers in person, or talk to them over the phone. And so reading my Etsy reviews is by far one of the most rewarding things about my job. I’m seriously humbled to know that I’ve made over 500 customers happy with their party supplies, printable parties or printed invitations. The excitement and appreciation I hear from customers helps me feel successful as a small business and provides encouragement to keep on bringing joy to others through party designs! So... “THANK YOU THANK YOU THANK YOU” ...let's do a special giveaway to celebrate! Enter the giveaway to win 50 lovely printed invitations! There’s no doubt in my mind that one of the reasons my invitation customers have left positive reviews is because of the wonderful local printer I work with. The quality of Buel’s Impressions Printing is ALWAYS on-point and gorgeous. And they are super fast! Which, in turn, allows me to ship invitations within a few days of proof approval. I also like to add a backside print for that extra touch - and always include a couple extra envelopes for any “oops” in addressing. If you haven’t tried Whirligigs Party Co. for printed invitations before, I encourage you to allow us the chance to WOW you! Enter at each website for up to FOUR chances to win! Subscribe to my blog mailing list, at the end of this post. Comment below that you’ve done both 1 & 2 for two entries. Optional: Let me know if you’ve got an invitation print or theme in mind. 2. Comment on the facebook giveaway post letting me know if you've got an invitation print or theme in mind. 2. Comment on the Instagram giveaway photo letting me know if you've got an invitation print or theme in mind. I look forward to announcing the winner Tuesday, Sept. 13! Giveaway entries must be received by 12 PM on Monday, Sept 12, and winner will be announced Tuesday. USA residents will receive free shipping. International customers can switch to a digital invitation or pay shipping difference themselves. Choose from one of my designs or send your own file. Includes backside design, if applicable. This promotion is in no way sponsored, endorsed or administered by, or associated with, Facebook, Instagram or Blogger.